I was talking about how badly my grill needed to be cleaned and how much I was dreading doing it. “I’ll clean it,” Chris said. There are jobs you have to do that you don’t mind doing, and jobs you have to do but hate. Some of the latter are cleaning jobs. For me, the grill is right up there near the top of the list. The trouble is, I love my grill. One of these days I might graduate to something fancy like a Big Green Egg, but for now, the Weber Spirit is the tool of choice. It’s an extension of the kitchen, a cooking utensil as useful as my iron skillet and one that gets more use than our microwave. We use it, in fact, year-round. All of that use comes at a cost to cleanliness. Marinades, oils, fats, and grease take a severe toll on your cooking surfaces. 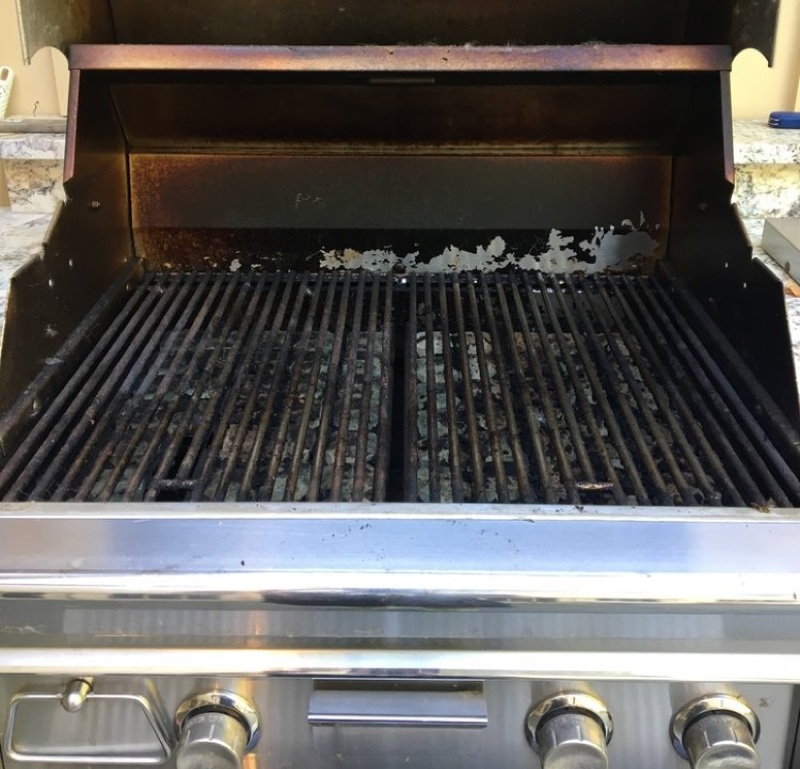 The grill needs to be periodically cleaned to remain functioning correctly (and safely). And this is where the trouble lies: cleaning these things is a dirty job that almost no one likes to do (including you, I’d bet). As a result, it never seems to get done. I was talking about this recently with Chris Collins, who offered to solve the problem for me. “I’ll clean it,” he said. The only reason this wasn’t really weird is that Chris owns a company called Hoosier BBQ Grill Clean and cleaning grills is his thing. On the appointed day and time, Chris arrived at my house towing his entire business behind his shiny truck. Inside the trailer were all the tools of the trade: a “clean and green” cleaning process that is one-part cleaning tank, one-part old-fashioned elbow grease, and two parts proprietary cleaning solution that is bio-degradable, non-toxic, odorless, and pet- and eco-friendly. Most importantly, it works. Chris takes all of the pieces apart and places the grill racks, flavor bars, and heat plates in their custom-built process tanks with the cleaning solution. While those are soaking, he removes the control knobs and other protrusions and thoroughly cleans everything: the grill box, the drip pan, all inside and outside surfaces. If there are parts needing attention (like the aluminum ‘flavor bars’ on my Weber), he’ll replace them. Then he gets to work on the grill plates and other internals, using equal amounts of effort and cleaning solution. Their process removes soot and all visible traces of grease and fat, and they get deep into all of those nooks and cranny’s you don’t usually notice. 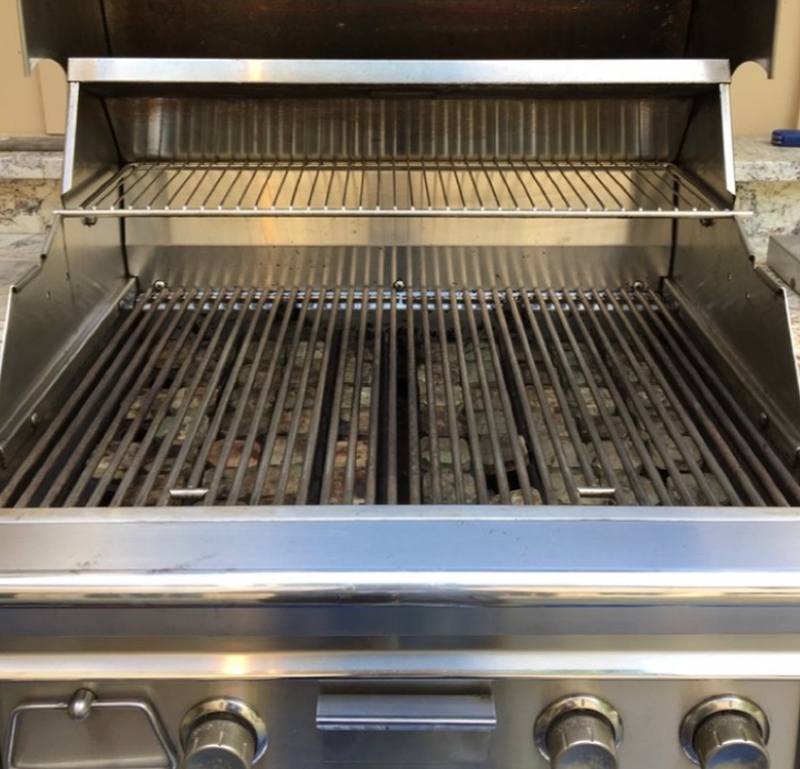 When finished, the whole thing goes back together, and what’s left is – I kid you not – a grill that looks as close to new as it did the day you bought it. (Be sure to see the before/after photos on the web site.) I was blown away by the difference he achieved with what was, admittedly, a somewhat neglected cooking surface. The whole process takes a few hours and can be scheduled when it’s convenient for you, though you really need not be present at the time. It’s a bonus that Chris is an extremely nice guy running a cool little business performing a service that you definitely need done and probably don’t want to do. Give yourself an early Father’s Day present that you’ll really enjoy. Check them out online at HoosierBBQClean.com or call or text him at 317-442-2226.